The Supermarine Spitfire was a development of the highly successful Schneider Trophy seaplanes in the late twenties and early thirties. However, despite the successes, the High Speed Flight had been disbanded and it was expected that no Treasury money would be made available to finance a British team for the 1929 meeting. The Air Ministry objected to the use of its pilots, but agreed to supply the aircraft. That said, the High Speed Flight reformed in February 1928. Air Ministry funding was not forthcoming for new engines and so Rolls Royce financed the building of a military engine with 'racing capabilities'. Whilst the engine was still a paper design, R J Mitchell of the Supermarine Company, began work on the S6 aircraft which would be used by the British team. The basis of the design was the successful S5 airframe and two S6s were ordered. The only challengers to make the race meeting were Italy who brought a further development of the M52 airframe, the M52R, and a new aircraft, the Macchi M67. It had been intended that France would compete after a six-year absence but the two designs chosen for the 1929 race were not completed in time and the team withdrew. As for the Americans, it was a familiar tale. The government still refused to support an entry for the Schneider Trophy and left any finances to be raised privately. This did happen, but the intended aircraft, the Kirkham-Williams Mercury, which was to have been powered by a secretly-built US Navy engine, was barely capable of sustained flight and again the US did not attend. Neither did the Germans who had hoped to race, but their Dornier project never got off the drawing board. On the eve of the race a small piece of metal was found in the engines of one of the S6s and after further investigation it was found that one of the pistons was damaged necessitating a cylinder block change. A sweep of the local hostelries and pubs raised enough Rolls Royce engineers to carry out the task, and after a full night's work and ground running, the aircraft was ready at 0800 on the day of the race. The race weather was perfect and the first aircraft airborne was the S6 of Flt Lt Waghorn. The aircraft performed beautifully until Waghorn reached the sixth lap the engine began to misfire forcing the pilot to climb in the hope that should it fail completely, he could glide to the end. The engine duly failed, but Waghorn had insufficient height to carry out his plan and landed on the water short of the finish, cursing his luck. When he sighted his engineers approaching the becalmed aircraft, he noticed that they had broad smiles on their faces - having miscounted his laps, he had, as Webster had at the previous meeting, flown one extra lap. It was on this lap that the engine had failed. D'Arcy Greig in the sole S5 and Warrant Officer Dal Molin of Italy in the M52R were caught up in a furious battle in the skies above, both at full chat in the event that Waghorn had failed to complete the distance. The remaining pilots and aircraft suffered a variety of problems. 'Batchy' Atcherley in the second S6 lost his goggles in the slipstream and flew the remainder of his race crouched inside the cramped cockpit, but was disqualified after misjudging a turn and going inside a pylon. The final realistic challenge to Waghorn's time ended when a coolant pipe broke on the second Macchi M67, scalding its pilot who successfully landed his aircraft before being taken to hospital for treatment. Flt Lt Waghorn's average speed of 328.63 mph (528.77 km/h) was some 44mph (71 km/h) faster than second-placed Dal Mollin in the M52R who just edged D'Arcy Greig into third by barely 2mph. The win set up, for the third time, the chance for a team to win the Schneider Trophy outright. As no less a person than Prime Minister Ramsey MacDonald commented, "We are going to do our level best to win again," and that is precisely what came about - which brought about the end of the races in 1931, since the rules stated that if the Trophy was won three times in a row, the winning team could keep it. Recognition: Sleek, graceful fuselage, noticeably slimmer than the Hurricane. Domed canopy with a smaller, more angular fin. From below, the wings have a more 'pointed' shape housing the main undercarriage which has a narrow track. Some The first order for 310 machines was placed three months later, followed by a further 200 the following year shortly before the tragic death of its designer at the age of 42. In April 1938 the Nuffield Organisation was awarded an order for 1,000 Spitfires to be built at a shadow plant planned for Castle Bromwich near Birmingham, and further orders in 1939 brought the number of aircraft on the order book to a total of 2,143 by the outbreak of war. Between August and December 1938 No. 19 Squadron at Duxford was equipped with the Spitfire Mk.1. By the outbreak of war nine squadrons were fully equipped and two others were in the process of conversion. A total of 1,583 Spitfire Is were built. Deliveries of the Mk. II (basically a Mk. I powered by a 1,175-h.p. Merlin XII) began in June 1940, but widespread re-equipment with the new version did not commence until the following winter, and it was the Mk. 1 which bore the brunt of the fighting during the Battle of Britain; by July 7th nineteen Fighter Command Squadrons were operational with the type. The Spitfire has always attracted more attention than the Hurricane, and is undoubtedly one of the most famous aircraft ever built. Its graceful lines combined with outstanding handling qualities to produce a "dream plane" extremely fast, and in comparison to contemporary types was second to none. Gilbert, Martin (1995). Second World War, Phoenix. ISBN 1857993462. Keegan, John (1989). The Second World War, Hutchinson. ISBN 0091740118. Liddel Hart, Sir Basil (1970). History of the Second World War, London: Cassell. ISBN 0304935646. Murray, Williamson and Millett, Allan R. (2000). A War to Be Won: Fighting the Second World War, Harvard University Press. ISBN 067400163X. Overy, Richard (1995). Why the Allies Won, Pimlico. ISBN 0712674535. Shirer, William L. (1959). The Rise and Fall of the Third Reich, Simon & Schuster. ISBN 0671624202. Weinberg, Gerhard L. (1994). A World at Arms: A Global History of World War II, Cambridge University Press. ISBN 0521443172. Haagse Bunker Ploeg : Photo site about the Atlantikwall in the Netherlands . FDR - Day of Infamy video clip 2 min. Veterans Of The US Armed Forces Services, information, resources, and image gallery for veterans of the United States Armed Forces. 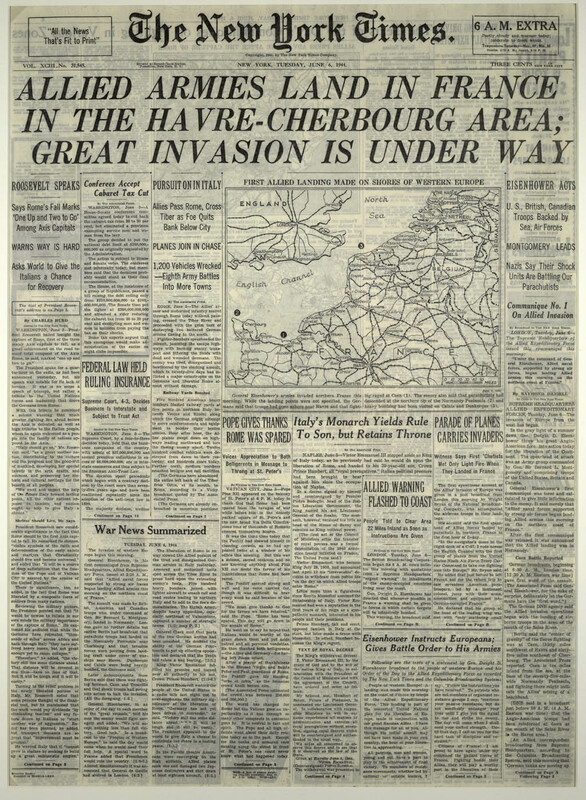 Front page of the 6 June, 1944 edition of The New York Times. Using Historical Statistics To Teach about World War II. ERIC Digest. Juno Beach - An indepth examination of one of Canada's greatest WWII contributions: Juno Beach.